For vegetative reproduction of animals and fungi, see Budding. 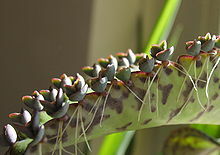 Production of new individuals along a leaf margin of the air plant, Kalanchoe pinnata. The small plant in front is about 1 cm tall. The concept of "individual" is obviously stretched by this process. Bryophyllum daigremontianum produces plantlets along the margins of its leaves. When they are mature enough, they drop off and root in any suitable soil beneath. Vegetative reproduction from a stem cutting less than a week old. Some species are more conducive to this means of propagation than others. A bulb of Muscari has reproduced vegetatively underground to make two bulbs, each of which produces a flower stem. Vegetative reproduction (also known as vegetative propagation, vegetative multiplication or vegetative cloning) is any form of asexual reproduction occurring in plants in which a new plant grows from a fragment of the parent plant or a specialized reproductive structure. Many plants naturally reproduce this way, but it can also be induced artificially. Horticulturalists have developed asexual propagation techniques that use vegetative plant parts to replicate plants. Success rates and difficulty of propagation vary greatly. Monocotyledons typically lack a vascular cambium and therefore are harder to propagate. Plant propagation is the process of plant reproduction of a species or cultivar, and it can be sexual or asexual. It can happen through the use of vegetative parts of the plants, such as leaves, stems, and roots to produce new plants or through growth from specialized vegetative plant parts. While many plants reproduce by vegetative reproduction, they rarely exclusively use that method to reproduce. Vegetative reproduction is not evolutionary advantageous; it does not allow for genetic diversity and could lead plants to accumulate deleterious mutations. Vegetative reproduction is favored when it allows plants to produce more offspring per unit of resource than reproduction through seed production. In general, juveniles of a plant are easier to propagate vegetatively. Although most plants normally reproduce sexually, many can reproduce vegetatively, or can be induced to do so via hormonal treatments. This is because meristematic cells capable of cellular differentiation are present in many plant tissues. Vegetative propagation is usually considered a cloning method. However, root cuttings of thornless blackberries will revert to thorny type because the adventitious shoot develops from a cell that is genetically thorny. Thornless blackberry is a chimera, with the epidermal layers genetically thornless but the tissue beneath it genetically thorny. Similarly, leaf cutting propagation of certain chimeral variegated plants like the snake plant (Sansevieria trifasciata), will produce mainly nonvariegated plants. Grafting is often not a complete cloning method because seedlings are used as rootstocks. In that case, only the top of the plant is clonal. In some crops, particularly apples, the rootstocks are vegetatively propagated so the entire graft can be clonal if the scion and rootstock are both clones. Apomixis (including apospory and diplospory) is a type of reproduction that does not involve fertilization. In flowering plants, unfertilized seeds are produced, or plantlets that grow instead of flowers. Hawkweed (Hieracium), dandelion (Taraxacum), some citrus (Citrus) and many grasses such as Kentucky bluegrass (Poa pratensis) all use this form of asexual reproduction. Bulbils are sometimes formed instead of the flowers of garlic. Meristem tissue makes the process of asexual reproduction possible. It is normally found in stems, leaves, and tips of stems and roots and consists of undifferentiated cells that are constantly dividing allowing for plant growth and give rise to plant tissue systems. The meristem tissue's ability to continuously divide allows for vegetative propagation to occur. Another important ability that allows for vegetative propagation is the ability to develop adventitious roots which arise from other vegetative parts of the plants such as the stem or leaves. These roots allow for the development of new plants from body parts from other plants. There are several advantages of vegetative reproduction, mainly that the produced offspring are clones of their parent plants. If a plant has favorable traits, it can continue to pass down its advantageous genetic information to its offspring. It can be economically beneficial for commercial growers to clone a certain plant to ensure consistency throughout their crops. Vegetative propagation also allows plants to avoid the costly process of producing sexual reproduction organs such as flowers and the subsequent seeds and fruits. For example, developing an ace cultivar is extremely difficult, so, once farmers develop the desired traits in apple, they use grafting and budding to ensure the consistency of the new cultivar and its successful production on a commercial level. However, as can be seen in many variegated plants, this does not always apply, because many plants actually are chimeras and cuttings might reflect the attributes of only one or some of the parent cell lines. Vegetative propagation also allows plants to circumvent the immature seedling phase and reach the mature phase faster. In nature, that increases the chances for a plant to successfully reach maturity, and, commercially, it saves farmers a lot of time and money as it allows for faster crop overturn. Vegetative reproduction offers research advantages in several areas of biology and has practical usage when it comes to afforestation. The most common use made of vegetative propagation by forest geneticists and tree breeders has been to move genes from selected trees to some convenient location, usually designated a gene bank, clone bank, clone-holding orchard, or seed orchard where their genes can be recombined in pedigreed offspring. A major disadvantage of vegetative propagation is that it prevents species genetic diversity which can lead to reductions in crop yields. The plants are genetically identical and are all, therefore, susceptible to pathogenic plant viruses, bacteria and fungi that can wipe out entire crops. Natural vegetative propagation is mostly a process found in herbaceous and woody perennial plants, and typically involves structural modifications of the stem, although any horizontal, underground part of a plant (whether stem, leaf, or root) can contribute to vegetative reproduction of a plant. Most plant species that survive and significantly expand by vegetative reproduction would be perennial almost by definition, since specialized organs of vegetative reproduction, like seeds of annuals, serve to survive seasonally harsh conditions. A plant that persists in a location through vegetative reproduction of individuals over a long period of time constitutes a clonal colony. In a sense, this process is not one of reproduction but one of survival and expansion of biomass of the individual. When an individual organism increases in size via cell multiplication and remains intact, the process is called "vegetative growth". However, in vegetative reproduction, the new plants that result are new individuals in almost every respect except genetic. Of considerable interest is how this process appears to reset the aging clock. Rhizomes are stem-like structures that grows horizontally across the ground and from which new roots and shoots may arise. They serve as protein and starch storage units serving as a nutrient source for newly developed plants. Examples of plants that use rhizomes are ginger, lilies and irises. Also known as stolons, runners are modified stems that, unlike rhizomes, grow from existing stems just below the soil surface. As they are propagated, the buds on the modified stems produce roots and stems. Those buds are more separated than the ones found on the rhizome. Examples of plants that use runners are strawberries and currants. Bulbs are inflated parts of the stem within which lie the central shoots of new plants. They are typically underground and are surrounded by plump and layered leaves that provide nutrients to the new plant. Examples of plants that use bulbs are shallots, lilies and tulips. Tubers develop from either the stem or the root. Stem tubers grow from rhizomes or runners that swell from storing nutrients while root tubers propagate from roots that are modified to store nutrients and get too large and produce a new plant. Examples of stem tubers are potatoes and yams and examples of root tubers are sweet potatoes and dahlias. Corms are solid enlarged underground stems that store nutrients in their fleshy and solid stem tissue and are surrounded by papery leaves. Corms differ from bulbs in that their centers consists of solid tissue while bulbs consist of layered leaves. Examples of plants that use corms are gladiolus and taro. Also known as root sprouts, suckers are plant stems that arise from buds on the base of parent plants stems or on roots. Examples of plants that use suckers are apple and banana trees. Plantlets are miniature structures that arise from meristem in leaf margins that eventually develops roots and drop from the leaves they grew on. An example of a plant that uses plantlets is the Bryophyllum daigremontianum (syn. Kalanchoe daigremontianum), which is also known as mother of thousands for its many plantlets. Keikis are additional offshoots which develop on vegetative stems or flower stalks of several orchids genera. Examples of plants that use keikis are the Phalaenopsis, Epidendrum, and Dendrobium genera of orchids. Apomixis is the process of asexual reproduction through seed, in the absence of meiosis and fertilization, generating clonal progeny of maternal origin. A cutting is a part of the plant, usually a stem or a leaf, is cut off and planted. Adventitious roots grow from cuttings and a new plant eventually develops. Usually those cuttings are treated with hormones before being planted to induce growth. Layering is a process which includes the bending of plant branches or stems so that they touch the ground and are covered with soil. Adventitious roots develops from the underground part of the plant, which is known as the layer. This method of vegetative reproduction also occurs naturally. Another similar method, air layering, involved the scraping and replanting of tree branches which develop into trees. Suckers grow and form a dense compact mat that is attached to the parent plant. Too many suckers can lead to smaller crop size, so excess suckers are pruned, and mature suckers are transplanted to a new area where they develop into new plants. In tissue culture, plant cells are taken from various parts of the plant and are cultured and nurtured in a sterilized container. The mass of developed tissue, known as the callus, is then cultured in a hormone-ladened medium and eventually develops into plantlets which are then planted and eventually develop into grown plants. An offset is the lower part of a single culm with the rhizome axis basal to it and its roots. Planting of these is the most conventional way of propagating bamboo. ^ "vegetative reproduction | horticulture". Encyclopedia Britannica. Retrieved 2017-09-22. ^ Swingle, Charles F. (1940-07-01). "Regeneration and vegetative propagation". The Botanical Review. 6 (7): 301–355. doi:10.1007/BF02919037. ISSN 0006-8101. ^ Scarcelli, N.; Tostain, S.; Vigouroux, Y.; Agbangla, C.; Daïnou, O.; Pham, J.-L. (August 2006). "Farmers' use of wild relative and sexual reproduction in a vegetatively propagated crop. The case of yam in Benin". Molecular Ecology. 15 (9): 2421–2431. doi:10.1111/j.1365-294X.2006.02958.x. ISSN 0962-1083. PMID 16842416. ^ Birget, Philip L. G.; Repton, Charlotte; O'Donnell, Aidan J.; Schneider, Petra; Reece, Sarah E. (2017-08-16). "Phenotypic plasticity in reproductive effort: malaria parasites respond to resource availability". Proc. R. Soc. B. 284 (1860): 20171229. doi:10.1098/rspb.2017.1229. ISSN 0962-8452. PMC 5563815. PMID 28768894. ^ Bonga, J. M. (1982). "Vegetative Propagation in Relation to Juvenility, Maturity, and Rejuvenation". Tissue Culture in Forestry. Forestry Sciences. 5. Springer, Dordrecht. pp. 387–412. doi:10.1007/978-94-017-3538-4_13. ISBN 9789048182725. ^ McKey, Doyle; Elias, Marianne; Pujol, Benoît; Duputié, Anne (2010-04-01). "The evolutionary ecology of clonally propagated domesticated plants". New Phytologist. 186 (2): 318–332. doi:10.1111/j.1469-8137.2010.03210.x. ISSN 1469-8137. ^ Priestley, Joseph Hubert; Swingle, Charles F. (1929). Vegetative Propagation from the Standpoint of Plant Anatomy. U.S. Department of Agriculture. ^ "root | Definition, Types, Morphology, & Functions". Encyclopedia Britannica. Retrieved 2018-04-19. ^ a b Hussey, G. (1978). "The application of tissue culture to the vegetative propagation of plants". Science Progress (1933- ). 65 (258): 185–208. JSTOR 43420451. ^ Snow, Allison A.; Whigham, Dennis F. (1989-10-01). "Costs of Flower and Fruit Production in Tipularia Discolor (Orchidaceae)". Ecology. 70 (5): 1286–1293. doi:10.2307/1938188. ISSN 1939-9170. JSTOR 1938188. ^ a b Zotz, Gerhard (1999). "Vegetative propagation in an epiphytic orchid occurrence and ecological relevance" (PDF). Ecotropica. 5. ^ a b Libby, W. (September 1973). "THE USE OF VEGETATIVE PROPAGULES IN FOREST GENETICS AND TREE IMPROVEMENT" (PDF). School of Forestry and Conservation and Department of Genetics. 4: 440–447. ^ "Disparate effects of plant genotypic diversity on foliage and litter arthropod communities - Semantic Scholar". 2008. Retrieved 2018-04-19. ^ Frankham, R (2005-07-27). "Conservation Biology: Ecosystem recovery enhanced by genotypic diversity". Heredity. 95 (3): 183. doi:10.1038/sj.hdy.6800706. PMID 16049423. ^ Reusch, Thorsten; Boström, Christoffer (2011-07-01). "Widespread genetic mosaicism in the marine angiosperm Zostera marina is correlated with clonal reproduction". Evolutionary Ecology. 25 (4): 899–913. doi:10.1007/s10682-010-9436-8. ^ (General J. Grant (1864). "Vegetative Reproduction in New York: a comprehensive study. Stony Brook University Press: NY, NY. ^ a b Forbes, James C.; Forbes, Jim C.; Watson, Drennan (1992-08-20). Plants in Agriculture. Cambridge University Press. ISBN 9780521427913. ^ Harada, Yuko; Iwasa, Yoh (1994-12-01). "Lattice population dynamics for plants with dispersing seeds and Vegetative propagation". Researches on Population Ecology. 36 (2): 237–249. doi:10.1007/BF02514940. ISSN 0034-5466. ^ a b Hickey, Michael; King, Clive (2000-11-16). The Cambridge Illustrated Glossary of Botanical Terms. Cambridge University Press. ISBN 9780521794015. ^ Kawasaki, Maria Lucia (1991-07-01). "Plant form. An illustrated guide to flowering plant morphology. By Adrian D. Bell". Brittonia. 43 (3): 145. doi:10.2307/2807042. ISSN 0007-196X. JSTOR 2807042. ^ Pate, J. S.; Dixon, Kingsley Wayne (1982). Tuberous, cormous and bulbous plants : biology of an adaptive strategy in Western Australia. Nedlands, W.A. : University of Western Australia Press. ISBN 978-0855642013. ^ Oliver, Chadwick Dearing (1980-01-01). "Forest development in North America following major disturbances". Forest Ecology and Management. 3: 153–168. doi:10.1016/0378-1127(80)90013-4. ISSN 0378-1127. ^ Roest, S.; Bokelmann, G.S. (1975-12-01). "Vegetative propagation of Chrysanthemum morifolium Ram. in vitro". Scientia Horticulturae. 3 (4): 317–330. doi:10.1016/0304-4238(75)90046-1. ISSN 0304-4238. ^ Spillane, Charles; Curtis, Mark D; Grossniklaus, Ueli (June 2004). "Apomixis technology development—virgin births in farmers' fields?". Nature Biotechnology. 22 (6): 687–691. doi:10.1038/nbt976. ISSN 1546-1696. PMID 15175691. ^ Ofori, D.A. ; Newton, A.C.; Leakey, R.R.B. ; Grace, J. (1996-08-01). "Vegetative propagation of Milicia excelsa by leafy stem cuttings: effects of auxin concentration, leaf area and rooting medium". Forest Ecology and Management. 84 (1–3): 39–48. doi:10.1016/0378-1127(96)03737-1. ISSN 0378-1127. ^ "Kumar, G. (2011). "Propagation of Plants by Grafting and Budding" (PDF). Pacific Northwest Extension. pp. 3–5" (PDF). ^ "Indiana Yard and Garden – Purdue Consumer Horticulture - Purdue University". Indiana Yard and Garden - Purdue Consumer Horticulture. Retrieved 2018-04-20. ^ Maini, J. S.; Horton, K. W. (1966-09-01). "Vegetative Propagation of Populus Spp. : I. Influence of Temperature on Formation and Initial Growth of Aspen Suckers". Canadian Journal of Botany. 44 (9): 1183–1189. doi:10.1139/b66-130. ISSN 0008-4026. ^ Reilly, Kathryn (4 April 1977). "VEGETATIVE PROPAGATION OF RADIATA PINE BY TISSUE CULTURE: PLANTLET FORMATION FROM EMBRYONIC TISSUE" (PDF). Forest Research Institute, New Zealand Forest Service, Rotorua. 7: 199–206. ^ Banik, Ratan (1995). A manual for vegetative propagation of bamboos. Bangladesh: Scenario Publications. p. 21. ISBN 978-81-86247-10-5.